President Vladimir Putin has signed the order to extend Russian counter-measures in response to Western sanctions. They restrictions will be prolonged for a year starting from June 24, 2015. 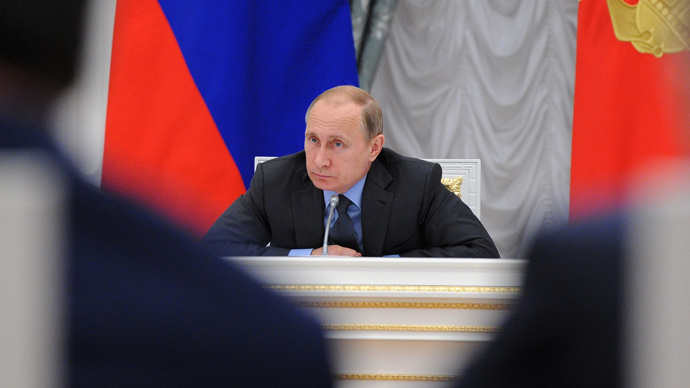 "The government has addressed a letter to me asking to extend the measures that we had taken in response to the actions of our partners from several countries,” Putin said.“Today, in accordance with this letter, I have signed a decree on extending certain special economic measures in order to ensure the safety of the Russian Federation," he said asking the government to prepare and publish a corresponding decree as soon as possible. The move comes in response to the EU decision on Monday to extend sanctions against Russia for six months. They were first imposed on August 1, 2014 over the events in Ukraine and the reunification with Crimea. Russia responded on August 7 when Prime Minister Dmitry Medvedev signed a decree to ban imports of beef, pork, poultry meat, fish, cheese, milk, vegetables and fruit from Australia, Canada, the EU, the US and Norway. On June 19, the EU prolonged economic sanctions against Crimea and Sevastopol, saying it considered the territories to be “illegally annexed” by Russia. It will remain in force until June 23, 2016, and will include a ban on the import of goods from Crimea and any investment in the region. There’ve been contrary reports on whether Russia is going to expand its blacklist of imported goods. On Tuesday, Russian food watchdog spokesman Aleksey Alekseenko said Russia was considering a ban on European chocolate and flowers. Russian Agriculture Minister Aleksandr Tkachev said the ministry had plans to limit imports of flowers and canned fish from countries on the sanctions list. However, there was no decision to include chocolate on the list, he said. In such cases Moscow’s reaction is always based on the principle of reciprocity, said the Russian presidential spokesperson Dmitry Peskov, TASS reports. "Russia wasn’t the one to propose this initiative, but in this case, since it’s [the sanctions regime – Ed.] extended, we will act on the basis of reciprocity," he said, commenting on the decision of the European Union earlier this week. "Russia believes sanctions are unjustified and illegal. But we have never been the initiators of restrictive measures;" said Peskov adding that it “harms not only the interests of those who participate in our country’s economic activity, but also themselves, the interests of taxpayers in the European states."